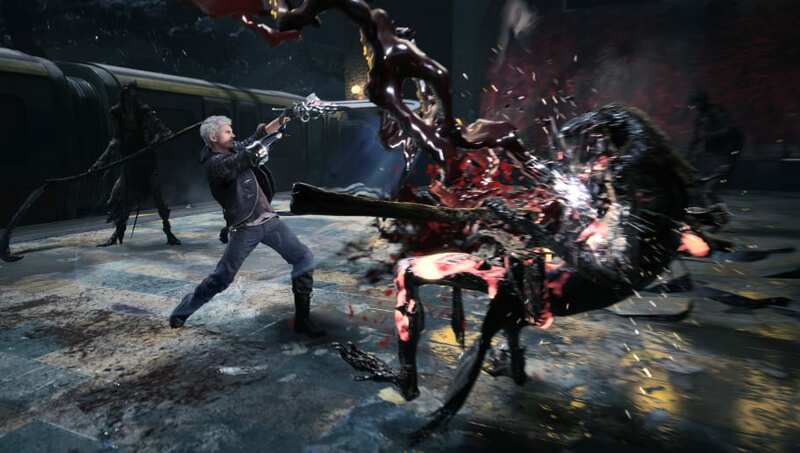 Devil May Cry 5 blue orb locations are the secret spots you'll want to hit to make your character as powerful as possible. These orb fragments can combine, four at a time, into full orbs that can be used to buy the game's strongest upgrades. Here's where to find them. After dropping to the lower section of the bridge, turn around to see the blue orb under the overhang. Destroy the floor in the room where you get the second Nidhogg to find an org fragment. Secret Mission 1: find a building that's falling apart and filled with tentacles. At one point, the area ahead of you will be destroyed by a tentacle. Go through the opening it creates to find the first Secret Mission. Complete it to earn a fragment. Jump down to the lower level of the building you reach after the second grapple point. Turn around and you'll find an orb fragment. After entering the sewers, you'll reach a staircase with a broken section near the third story. Wall jump to the platform above the doorway and use the grapple point to jump through a hole in the ceiling. Another orb waits there. Secret Mission 2: After grabbing the previous fragment, drop to the bottom of the stairs. Look up to find the pentagram that marks the secret mission. Beat this mission for another blue orb. When you find a Nidhogg hatchling, watch out for a tentacle wall you can use the Nidhogg to destroy. A blue orb is on the other side. Secret Mission 3: When you come across a cobbled area with a skeleton mural on one wall, destroy that wall using V's summon Nightmare. Grab the Nidhogg hatchling inside, then go back to the entrance and follow the path on the left side of the mural building. Destroy the two Qliphod roots at the end, then head up to find the pentagram and earn another orb fragment. Secret Mission 4: During the boss fight in the construction site, keep an eye out for a wall of boxes and poles. Smash it and follow the stairs up to find the pentagram and earn a blue orb fragment. At the second set of elevators, jump over to the devil breaker and follow the chain of grappling points to the top of the room. When you get to the last vein in the level, walk around behind it and kill the root that's hiding there. When you walk back to the entrance, an orb will have appeared. Secret Mission 5: Head back to the start of the grappling points and follow the second chain of points into a chasm. Stand in the center and look around for the pentagram and pick up another fragment. Run through the clenching door after a large room and take the tunnel upward. At the top, you'll find the orb sitting on a ledge to your left. Secret Mission 7: After the Flaming Hellbat fight, take the door on the right as high as you can go. When Dante remarks on being able to find something, turn around to see the pentagram and earn the next fragment. In the building with the checkered floor, destroy the root then drop down to the lower level. Go left to find a dark room with the blue orb fragment inside. Secret Mission 8: Near the beginning of the level, head into some ruins. Destroy the red orbs and jump back onto the platform that led there to see a red platform. Head there to line up the pentagram and earn another blue orb fragment. In the room with the pool of blood, behind one of the blood sacs is a room with a couple of platforms. Follow them to find a fragment. Secret Mission 9: After dropping past the statue, face the red smears on the wall. Jump to the platform behind you and line up the pentagram for another fragment. Secret Mission 10: The second Qliphoth root after the fight with old friends reveals a pentagram after destroying it. Turn away from where the camera tells you to look to find it and get another fragment. After the fight with a big enemy, you'll find a grapple pad on the floor of a room. Follow this path to the top for a fragment. Secret Mission 11: At one of the upgrade statues, go behind it and surf on Punch Line to find a steep hill. Nero will remark on a nearby presence, at which point you should be able to see the red spot that leads to the pentagram. Follow the path until you see the orb fragment. Use the Sin Devil Trigger to hover over.